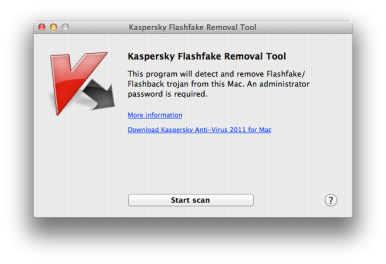 Kaspersky Lab on Thursday suspended distribution of its tool to remove the Flashback malware attacking Mac computers, saying the tool itself was making unacceptable alterations to user computers. A replacement is expected soon. The lab’s Flashfake Removal Tool was suspended after Kaspersky discovered that it was erroneously removing user settings—including auto-start configurations, user configurations in browsers, and file sharing data—from infected computers. It had been in operation since Monday. to run Apple’s Software Update. The malware has reportedly affected more than 600,000 Macs. Other options remain available. For example, Apple issued a patch last week to close the Java vulnerability that Flashback exploits, though that update won’t detect whether you’re infected or remove the malware. Last week, F-Secure published a set of Terminal commands to uncover the exploit, and on Monday an independent programmer released a Mac app that can check for the infection as well. Kaspersky, meanwhile, asked users who had experienced problems with its Flashflake Removal Tool to email the company, or call its Moscow home office at 7 (495) 797-70-32. It is there to provide support or answer questions.